The NH Vienna Airport is located next to the World Trade Center at the airport. Guests are 15 minutes from the city center by train. The NH Vienna Airport Hotel is located at the airport, and shuttle service is available. It is 20 km from the main train station in the center of the city, and rail connections are available in the terminals. The nearest highway connection is 500 meters away. There are 500 rooms at the NH Vienna Airport Hotel, designed to feature modern amenities and furnishings. Rooms have cable television, mini bars, and en suite bathrooms. Non-smoking areas are designated. 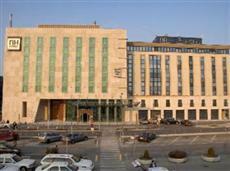 The NH Vienna Airport Hotel is a modern business and leisure hotel with a glass and marble contemporary façade. The hotel has 2,000 square meters of conference space capable of accommodating up to 600 people. There are 20 meeting rooms. The hotel has a full service restaurant, Mundo, as well as a cocktail bar. There is a fully equipped gym, a steam room, spa, and a sauna.